Retro British TV lives on in Tokyo. Iconic program Thunderbirds has its own official cafe, which serves up salute and Thunderbirds fandom. The food doesn't exactly look spectacular, but the inside of the restaurant definitely does. Inside, there are rare items from the show as well as replica Thunderbird vehicles on display. Episodes are on continuous loop. Website Japan Trends recently visited the cafe, which is in Tokyo's "book town" of Jimbocho (and not the otaku mecca of Akihabara), and found out that most patrons either lived or worked nearby—or were old enough to have seen the shown when it originally aired in the 1960s. Thunderbirds, of course, and its "Supermarionation" marionette puppetry have been hugely influential, inspiring the likes of Team America, among many other projects. The original program has a following in Japan and even spawned an anime sequel in 1982 called Thunderbirds 2086. 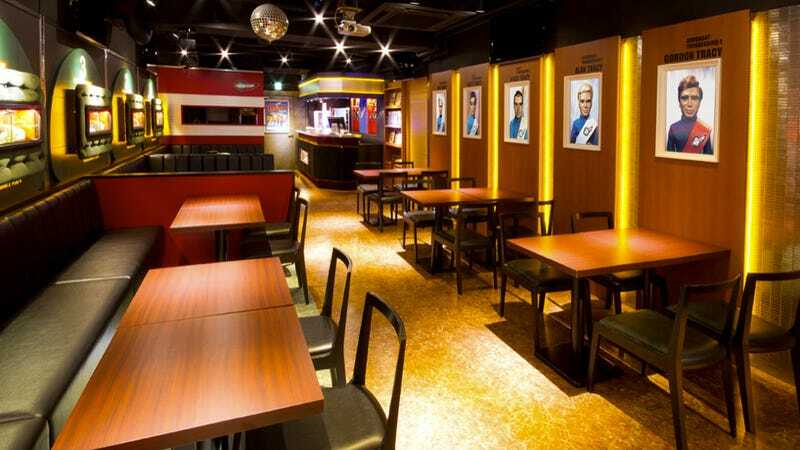 The official Thunderbirds Cafe opened in Tokyo this past June. Five, four, three, two, one, Thunderbirds Cafe go!